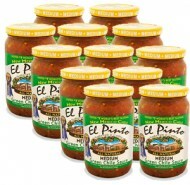 The Tequila Bar at El Pinto carries the best selection of premium tequilas available in Albuquerque and all New Mexico. With a selection of over 160 tequilas to choose from, no matter your choice of a premium sipping tequila, a premium mixing tequila for a perfect margarita, or a high quality tequila for margarita pitchers on the El Pinto patio, there is something for everyone. For tequila connoisseurs who want to taste the absolute best at our Albuquerque restaurant, choose from the Patron Gran Burdeos Anejo, or the unique Gran Centenario Leyenda, a Herredura Seleccion Suprema, the Don Julio 1942, or maybe a Gran Patron. Each has a distinctive character and worthy of super premium status. Also recently added is the Don Julio Real, Partida Elegante, Milagro Barrel Select Anejo, and El Tesoro Paradiso, DeLeo Diamante, and Deleon Anejo among other super premium tequilas that are added as we have requests. At El Pinto we take our margaritas seriously! All premium margaritas are made with hand-made simple syrup made in the El Pinto Tequila Bar, fresh squeezed lime juice squeezed that day, and agave nector when appropriate. For a perfect margarita, choose a premium handmade margarita from a wide selection of offerings. Also, be sure to try the Salsa Twins favorite margarita, the house specialty at the Tequila Bar made with El Pinto's specially produced Patron Barrel Select Anejo, Cointreau, simple syrup, and fresh squeezed lime. Another popular favorite is the "Silver Coin" made only with Herredura Silver, Cointreau, fresh squeezed lime, and house made simple syrup. This is the best of "Old Mexico" and the way margaritas have been enjoyed for generations. It is the perfect blend of tart and naturally sweet for a relaxing afternoon on the El Pinto outdoor patio. To get a sampling of various different tequilas at the Tequila Bar at El Pinto, choose a tequila flight. You receive a portion serving of three different tequilas and sangrita as a pallet cleanser. Choose from three different fixed flights: Patron, Don Julio or a Seleccion variety, or you can pick any three tequilas on the menu priced $13 or less and pay only $15. 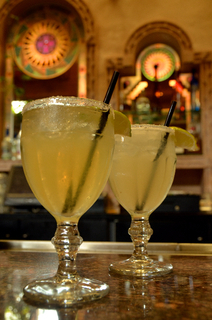 Happy Hour at the El Pinto Tequila bar is Monday thru Friday from 4:30 - 6:30 p.m. Enjoy $1.00 off all drinks served in the lounge and a $2 off the Cantina menu.